It is easy to ascribe mistakes in our personal lives to the motto “You live and you learn.” However, mistakes in business are not as easy to shrug aside. Poor business decisions can have adverse financial and legal implications for your company, prematurely end your dream of entrepreneurship, and even impact the security of your family. Although all businesses face an ever-present threat of closure in today’s unpredictable economic, technological, and sociopolitical environment, new businesses are among the most at risk of failure. Fifty percent of all start-ups in the U.S. close shop within 5 years. While the underlying reasons for the failure of a business are often complicated, there are certain errors that many new business owners tend to make. Starting your business with a large amount of debt, be it money you owe the bank or your family, places immediate pressure on you to start making profits. A bank loan puts the additional financial strain of paying a monthly installment. A smarter move would be to have adequate savings to begin your business and then work with a shoestring budget and wait for the cash to start flowing in before you decide to invest further. It’s also recommended that you have an alternate source of income or enough savings to meet your personal expenses for the next one or two years. What additional funds will you need as the business picks up over the next few months/years? Who are your customers and how will you market to them? By when can you expect to break-even? How many people do you need to employ initially and at a later stage? What will be your product distribution strategy? What are your strengths and weaknesses as a business? A business plan also helps identify priorities when you are confronted with conflicting business decisions. Business owners who do not spend the time to create a detailed business plan tend to fail. Cash is the lifeline of your business. Focusing mostly on sales numbers and extending credit to too many customers can lead to a business cash crunch. Yet, many new business owners don’t know how to even read a cash flow statement. It is imperative to learn how to monitor this crucial metric of your business. Slashing prices to attract the initial flow of customers and get the word out is a strategy that works best only in the launch phase. However, undercharging what you sell can undermine your cash flow and make it difficult to raise prices later on with existing clients. It can also lead to the perception that what you are offering is of lesser value than your competitors. You don’t need to have the lowest price in order to get business. Reasonable pricing coupled with quality product and service will drive customers to your door. One of the biggest mistakes startup entrepreneurs make is trying to do everything themselves. While you undoubtedly know your business best, you cannot be the master of everything. If you want your business to grow, you need to hire people with expertise in specific fields such as accounting, operations, and marketing. Hiring skilled people can help you achieve success faster, and at a larger scale. Starting a business is demanding and often times stressful. Therefore, it is equally important to strike a work-life balance, and ensure that you get adequate rest and exercise to remain fighting fit for the challenges ahead. What mistakes have you made as a small business owner, and how did you overcome them? 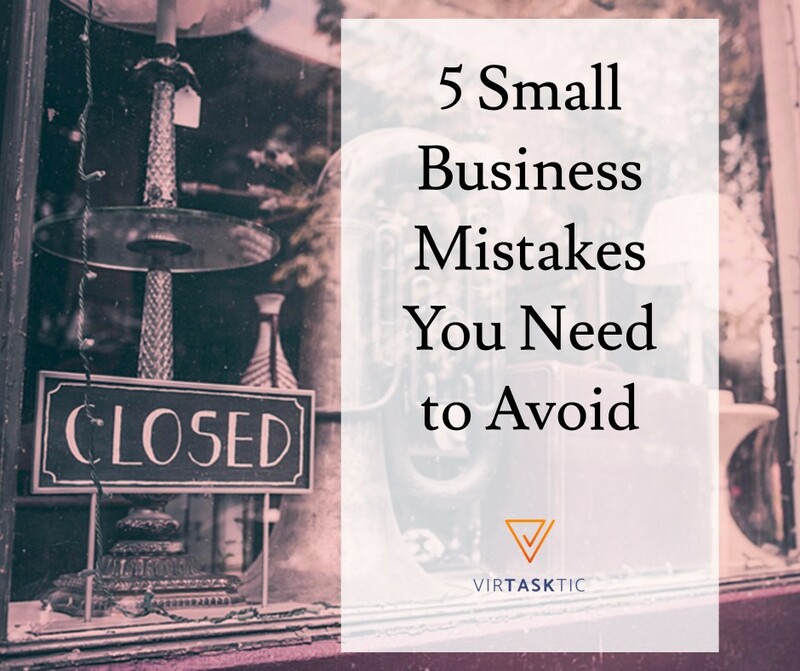 For more great small business tips and advice, check out the VirTasktic blog! VirTasktic provides the marketing and operational support your small business needs to soar to success. Visit our website to learn more about our services.